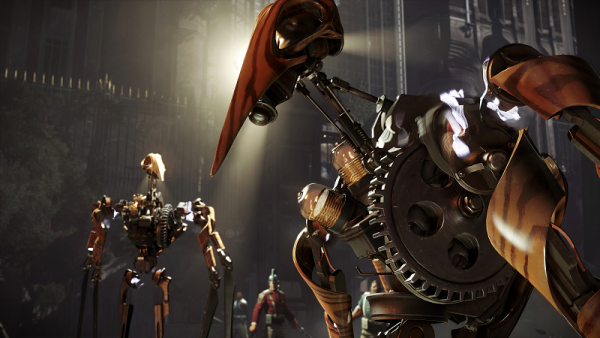 Even though Dishonored 2 is a single-player game, you probably won’t be able to jump in the minute your copy arrives. Dishonored 2 isn’t officially out until Friday, but plenty of copies are already out in the wild. Whether it be due to retailers breaking street dates, or simply customers getting their copies early because they pre-ordered. Thanks to these players, we now know the game has a day one patch, and how big it is. On PS4, one Reddit user reports the patch is a hefty 9.1GB download. As for Xbox One, Press-Start confirmed the update is also 9GB for the disc version. There’s no way to see patch notes on Xbox One, however, though the notes are likely very similar. If you’re going the digital route, your pre-load will include the patch, and it’s a 48GB download on PS4. Dishonored 2 is out Friday on PC, PS4, and Xbox One. You get the game one day early if you pre-order.